I felt myself falling in slow motion. Over I went and my foot remained in the hole, while my body flung over that way…to the right. I heard a sound as though a thick elastic band had just hit a wall. I looked up. The dog walker twenty feet from me walked past, hitching her brown and white collie to her lead. I was looking up from a funny angle. Max was sitting at my head, tied tight by umbilical lead. I wondered about moving. My hip was hurting. Slowly, I pulled my foot from the hole. The guy on the bike flew past me. 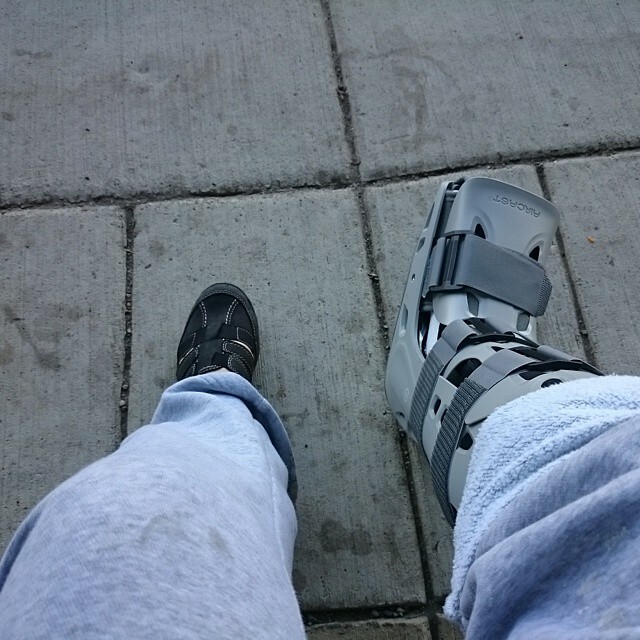 This entry was posted in Dogs, Reflection and tagged Broken Foot, Casts, Dog Walking, dogs, Fractures, Kindness by Painter Lady. Bookmark the permalink. This sounds like a modern dog-walker’s version of the story of the Good Samaritan. Where was he/she? my goodness.. sounds almost exactly like what happened to me.. At school in our field, got stuck in a hole as I continued moving forward. I hope you are healing well. Major bummer to be immobile and injured.